Are your prepared for the ultimate rock tour this summer?!? The Pixies and Weezer are teaming up for a joint tour across North America, and they’re taking The Wombats with them as support! This incredible lineup will arrive at the Hollywood Casino Ampitheatre on Saturday 7th July 2018 – be there! Grab your tickets NOW for the show of a lifetime! Opening act The Wombats are hitting the road with their brand new upcoming album “Lemon To A Knife Fight.” Weezer also will be promoting a recent release, their eleventh album “Pacific Daydream”. With the number 1 hit “Feels Like Summer,” and enthusiastic responses from critics and audiences alike, it’s one of the band’s best records to date. What’s more, it’s described by Rivers Cuimo as having a "darker, sadder undertone to it relative to" their previous albums, and marks the biggest departure from the band’s typical sound yet! The Pixies, since reforming in 2004, have delighted fans with “Indie Cindy”, their first release since 1991, and their 2016 album “Head Carrier,” featuring new bass player Paz Lenchantin. Known for their music-focused live shows, often going on for 75 minutes or more, fans will be treated to a wide range of songs from the Pixies entire and extensive repertoire. What are you waiting for?? 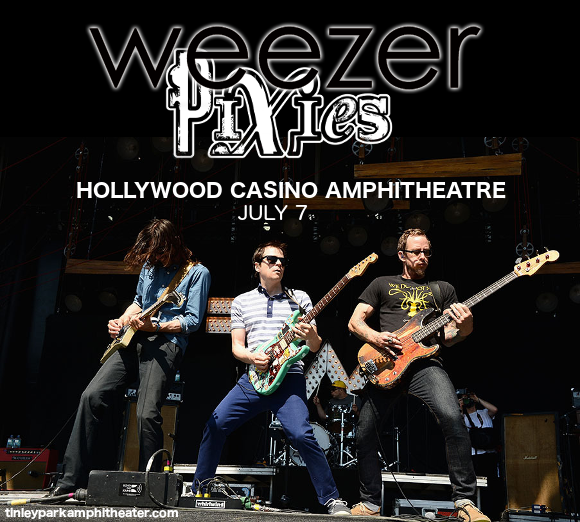 Grab your tickets to see The Pixies, Weezer and The Wombats LIVE today! !